COTGM member Sean Breadin, aka Sedayne, is a professional storyteller, singer of traditional ballads & folk songs and player of diverse & ancient musical instruments. 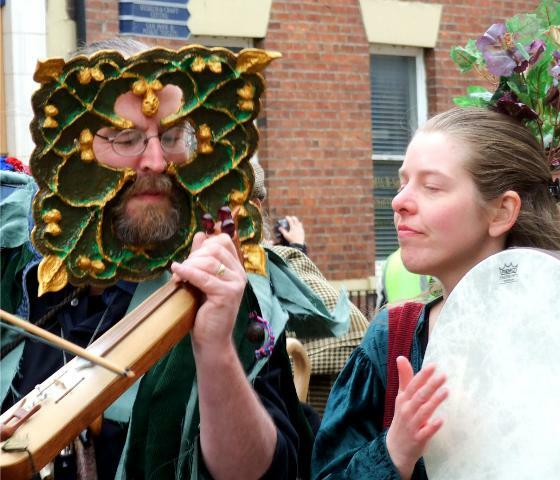 For this years Morpeth Northumbrian Gathering he went again as a Green Man accompanied by Rapunzel. Rapunzel has been singing all her life, with passions encompassing folk, country and classical, holding an impressive CV in all respects. A gifted instrumentalist, she is just as likely to be found singing the ballad of Tam Lin as she is her own compositions or the songs of Laura Nyro. Both went resplendent in green carnival garb. The fantastic mask Sean is wearing is based on a sinister supporter from a Chester Cathedral misericord. His thinking is that a lot of these sort of GM types could well be depictions of medieval carnival masks, so he thought the best thing to do would be to make one (using such traditional mediaeval materials as Ikea packing cases, organic flour, water & toilet paper) to see how such a thing might work in reality.